WR Robby Anderson vs. CB Malcolm Butler – Anderson has had a very nice 2017 season, as he currently ranks 13th out of 90 qualified receivers in yards per route run at 1.99. His overall grade of 78.3 leads the Jets receivers and puts him 32nd out of 116 qualified receivers. He will likely see a lot of Malcolm Butler, who hasn’t been terrific this year. He has allowed 698 yards in coverage, which is the seventh-most among all cornerbacks this season, and his overall grade of 78.8 ranks 47th out of 121 qualified cornerbacks. G James Carpenter vs. ED Trey Flowers – Carpenter has a pass-blocking efficiency of 94.9 in 2017, which ranks tied for 62nd out of 77 qualified offensive guards. He will likely be faced with controlling Trey Flowers, New England’s best pass-rusher, who moves to the interior in the nickel package. Flowers has an overall grade of 83.7 this year, which puts him 24th out of 111 qualified edge defenders. It will be interesting to see if Carpenter can hold his own against the youngster. WR ArDarius Stewart vs. CB Stephon Gilmore – This is an area where the Patriots will have a significant advantage. 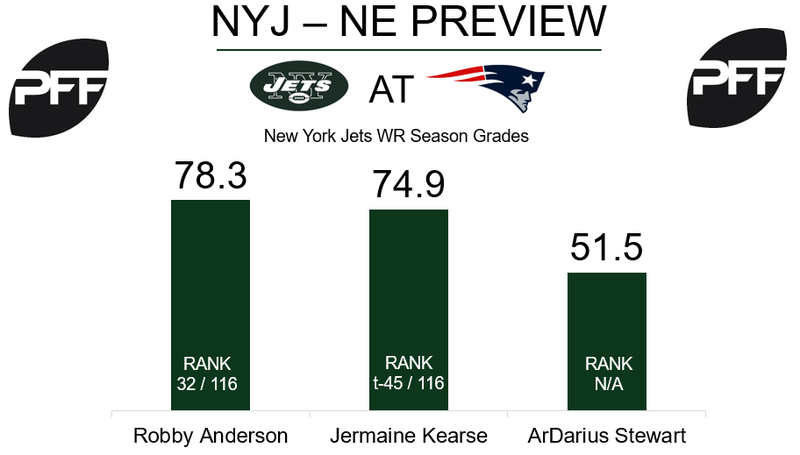 When the Jets move Jermaine Kearse to the slot, Stewart will have a tough time with Gilmore outside. Stewart’s overall grade of 51.5 would put him 82nd out of 116 receivers if he qualified. Gilmore on the other hand, is tied for 22nd among 121 cornerbacks with an overall grade of 84.5. However, Gilmore is coming off a tough game against the Bills, in which he allowed five of the seven balls thrown his way to be completed for a passer rating of 103.3. We will see if he can bounce back this week. QB Tom Brady vs. S Marcus Maye – Tom Brady looks set to complete the 2017 regular season as the quarterback with the highest overall grade. He sits at 94.8 through 16 weeks and is the only elite-graded quarterback in the league. Brady’s spent a significant portion of his career capitalizing on a quick release, but this year he leads the league in what might be an unexpected category. He’s completed 62.8 percent of his passes that take 2.6 seconds or more for him to throw, which is No. 1 among qualifying quarterbacks, and 16 of his 30 touchdowns came from throws that took 2.6-plus seconds to develop. Jets safety Marcus Maye will often be the safety involved in these longer-developing plays. Maye’s 45.1 cover snaps per reception is the ninth-best mark among qualifying safeties, as is his 0.34 yards allowed per snap in coverage. WR Brandin Cooks vs. CB Morris Claiborne – Brandin Cooks is the Patriots’ highest-graded wide receiver at 78.1 overall, tied for 33rd out of 116 qualifying wide receivers. His wide receiver rating of 107.7 is the 13th-highest rating among 90 qualifying wide receivers. In the teams’ Week 6 matchup, cornerback Morris Claiborne covered Cooks on all but one of Cook’s targets lined up outside, and 74 of Cook’s 93 yards were gained in Claiborne’s coverage. Claiborne’s overall grade of 44.5 is tied for 103rd out of 121 eligible corners. He’s allowed 1.09 yards per coverage snap, a figure tied for 56th among 123 eligible cornerbacks. 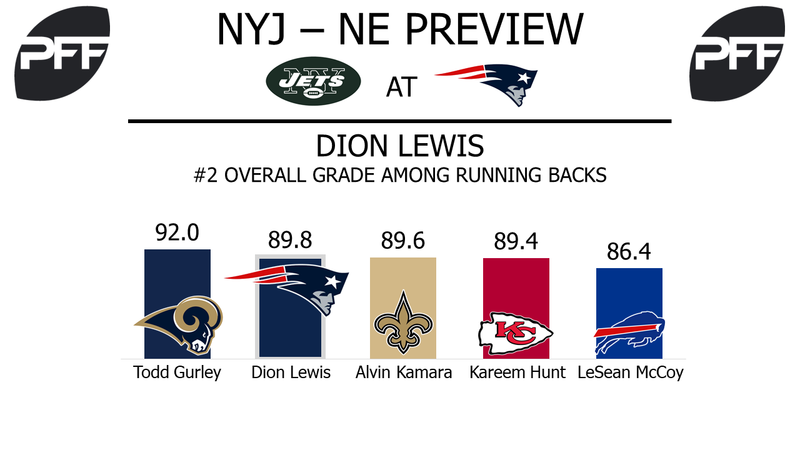 RB Dion Lewis vs. LB Demario Davis – Dion Lewis owns the second-best overall grade among qualifying running backs through 16 weeks at 89.8. His 83.0 elusive rating is third-best, and he still has yet to allow a single pressure on 32 pass-blocking snaps on the season. Linebacker Demario Davis presents a significant challenge as a run defender. His 85.4 overall grade is ninth-best out of 93 qualifying linebackers, while his 35 run stops are sixth-most out of 54 qualifying inside linebackers. His 12.7 tackling efficiency against the run is merely 44th out of 77 eligible inside linebackers, and his performance in this area will be key to limiting what Lewis does best.